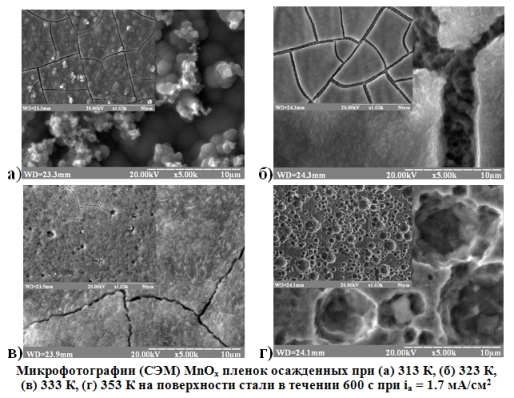 The influences of temperature and substrate material (platinum, steel 12С18N10T) on the mechanism of the electrochemical oxidation of Mn2+ to MnOx in the acetic acid electrolyte were investigated using hronovoltamperometry method. Analysis of polarization curves at T ≤ 323 K proved that the hydrolysis reaction like rate-determining step strongly influenced the process of oxide film formation. It was observed the additional oxidation peak currents on i, E - curves at T ≥ 323 K. It has been interpreted like another manganese oxide film formation mechanism take place. It was experimentally found that the substrate material didn’t substantial effect on the MnOx electrodeposition process. The structures of films formed at T ≥ 333 K was investigated using X-ray diffraction. The polycrystalline coatings consisting of a mixture γ - MnO2 and Mn3O4 phases with different crystallographic orientation were observed. The analysis of XRD patterns was allowed to estimate the dependence of Mn3+ / Mn4+ratio in the film from the temperature of coating deposition. It was determined the dependence of the crystalline degree from the temperature of coating deposition. Scanning electron microscopy (SEM) was used to study the morphology of the obtained samples. It was found a significant cracking on the coating obtained at T = 323 K. It has been explained changing of hydration degree in the oxide. Zaretskiy, S. A., Suchkov, V. N., Shlyapnikov, V. A. Tehnologiya elektrohimicheskih proizvods, Moskow, 1970, 423 р.
Duarte, M.M.E., Pilla, A.S., Mayer, C.E. Electrooxidation of Mn(II) to MnO2 on graphite fibre electrodes. J. Appl. Electrochem., 2003, vol. 33, p. 387-392. Petitrierre, J-Ph., Comninellis, Ch., Plattner, E. Oxydation Du MnSO4 en dioxide de manganese dans H2SO4 30%. Electrochem. Acta, 1990, vol. 35, no. 1, p. 281 287. Davies, G. Coord. Some aspects of the chemistry of manganese (III) in aqueous solution. Chem. Rev., 1969, vol. 4, p. 199-224. Rogulski, Z., Chotkowski, M. Electrochemical behavior of MnO2/RVC system. Journal of New Materials for Electrochemical Systems, 2006, no. 9, p. 401-408. Gorbachev, S.V. Effect of temperature on electrolysis as kinetic method for investigating the nature of the electrochemical processes. Chetvertoe soveschanie po elektrohimii. Sb. nauchnyih trudov, 1959, p. 61-71.